Marc Chaumont, "Deep Learning in steganography and steganalysis from 2015 to 2018", Elsevier Book chapter, draft version n1 (April 2019). This book chapter is a draft version that will be published as a book by ELSEVIER Inc. This chapter will appear in 2020 in the book titled: "Digital Media Steganography: Principles, Algorithms, Advances", Book Editor: M. Hassaballah. A revised version should be available before the end of 2019. 39 pages. pdf. Johanna Pasquet, Jérôme Pasquet, Marc Chaumont, and Dominique Fouchez, " PELICAN: deeP architecturE for the LIght Curve ANalysis ", 15 pages, Accepté pour publication le mardi 19 Mars 2019, Astronomy and Astrophysics A&A, Worldwide astronomical and astrophysical research, Section 15 of Numerical methods and codes, 15 pages. Impact Factor = 5.567. pdf. presentation. Younes Zegaoui, Marc Chaumont, Gérard Subsol, Philippe Borianne and Mustapha Derras, "Urban object classification with 3D Deep-Learning", JURSE'2019, Joint Urban Remote Sensing Event, Co-sponsored by IEEE GRSS and ISPRS, Vannes, France, May 22-24, 2019, 4 pages. pdf, slides. Une version longue en français est disponible ici (pdf), et a été présentée à l'Atelier Deep Learning pour la Télédétection, DLT'18, lors de la conférence internationale francophone Spatial Analysis and GEOmatics, SAGEO'2018. Anthony Brunel, Johanna Pasquet, Jérôme Pasquet, Nancy Rodriguez, Frédéric Comby, Dominique Fouchez, Marc Chaumont, " A CNN adapted to time series for the classification of Supernovae ", EI'2019, in Proceedings of Color Imaging XXIV: Displaying, Processing, Hardcopy, and Applications - joint sessions dealing with color in astronomy / astrophysics, Part of IS&T International Symposium on Electronic Imaging, Burlingame (suburb of San Francisco), California USA, 13 - 17 January, 2019. pdf, slides. Présentation orale (PAS D'ACTES) : Younes Zegaoui, Marc Chaumont, Gérard Subsol, Philippe Borianne, Mustafa Derras, " Classification d'objets urbains à partir de données LiDAR 3D terrestre par Deep-Learning ". Atelier Deep Learning pour la Télédétection, DLT'18, conférence internationale francophone Spatial Analysis and GEOmatics, SAGEO'2018, Montpellier, 6 novembre 2018. Lien vers le texte de 14 pages (pdf). Lien vers la présentation (slides). La version courte de ce document a été publié à JURSE'2019. L'atelier Deep Learning pour la Télédétection, DLT18, https://dlt18.sciencesconf.org/, se déroule dans le cadre de la conférence internationale francophone Spatial Analysis and GEOmatics (http://www.sageo2018.fr), SAGEO'2018, sous l'égide du GdR MAGIS du CNRS, Montpellier, 6 novembre 2018. La conférence internationale francophone SAGEO est un événement annuel majeur dans le paysage de la Géomatique, de l'Analyse Spatiale et des Sciences de l'Information Géographique. Ahmad Zakaria, Marc Chaumont, Gerard Subsol, " Quantitative and Binary Steganalysis in JPEG: A Comparative Study ", EUSIPCO'2018, European Signal Processing Conference, 3-7 September 2018, Rome, Italy, 5 pages. pdf. poster. Sébastien Villon, David Mouillot, Marc Chaumont, Emily S.Darling, Gérard Subsol, Thomas Claverie, Sébastien Villéger, " A Deep learning method for accurate and fast identification of coral reef fishes in underwater images ", Ecological Informatics, An International Journal on Ecoinformatics and Computational Ecology from Elsevier, Received 10 March 2018, Revised 14 August 2018, Accepted 3 September 2018, Available online 5 September 2018. https://doi.org/10.1016/j.ecoinf.2018.09.007, Impact Factor: 1.820, 5-Year Impact Factor: 2.122. pdf. Younes Zegaoui, Marc Chaumont, Gérard Subsol, Philippe Borianne and Mustapha Derras, " First Experiments of Deep Learning on LiDAR Point Clouds for Classification of Urban Objects ", Congrès CFPT'2018 (Congrès de la société Française de Photogrammétrie et de Télédétection), https://sfpt2018.ign.fr, (conjointement au congrès RFIAP'2018, Reconnaissance des Formes, Image, Apprentissage et Perception), 26-28 juin, Marne-la-Vallée, France. Papier court de 3 pages, pdf, poster. Link on our LIRMM-BL 3D Urban Object Scan Dataset: link. Sébastien Villon, David Mouillot, Marc Chaumont, Emily Darling, Gérard Subsol, Thomas Claverie ,Sébastien Villéger, " A deep learning algorithm for automatic identification of coral reef fish species on images " World Conference on Marine Biodiversity 2018, WCMB'2018, May 13-16, 2018, Montréal, Canada. Abstract 1 page: pdf. Best Poster Presentation - First Prize - Sébastien Villon : pdf. Mehdi Yedroudj, Frédéric Comby, and Marc Chaumont, " Yedrouj-Net: An efficient CNN for spatial steganalysis ", IEEE International Conference on Acoustics, Speech and Signal Processing, ICASSP'2018, 15–20 April 2018, Calgary, Alberta, Canada, 5 pages. pdf, poster. FAQ and parameters for Yedroudj-Net are given here: Yedroudj-Net. B. Commandre, D. EN-Nejjary, L. Pibre, M. Chaumont, G. Subsol, L. Deruelle, M. Derras, C. Delenne, N. Chahinian. " Détection de regards de visite sur des images à très haute résolution spatiale par une méthode d'apprentissage ", TEMU'2018, Atelier Télédétection pour l'Etude des Milieux Urbains, à la Maison Interuniversitaire des Sciences de l’Homme, Strasbourg, France, 19 - 20 mars 2018. Présentation orale. https://temu2018.sciencesconf.org/. Abstract 1 page (pdf). Slides (pdf). Mehdi Yedroudj, M. Chaumont, F. Comby, " How to augment a small learning set for improving the performances of a CNN-based steganalyzer? ", EI'2018, in Proceedings of Media Watermarking, Security, and Forensics, Part of IS&T International Symposium on Electronic Imaging, San Francisco, California, USA, 28 Jan - 2 Feb 2018, 7 pages. pdf, slides. FAQ and parameters for Yedroudj-Net are given here: Yedroudj-Net. Marc Chaumont, " The emergence of Deep Learning in steganography and steganalysis ". Tutorial given at a research day in France, the 16th of January 2018, Poitiers, France, Journée " Stéganalyse : Enjeux et Méthodes", labelisée par le GDR ISIS et le pré-GDR sécurité, January 2018 DOI 10.13140/RG.2.2.35080.32005 01/2018, DOI: 10.13140/RG.2.2.35080.32005. The tutorial is about the infancy of CNNs in steganography / steganalysis in the period 2015 - 2017. Carole Delenne, Nanée Chahinian, Jean-Stephane Bailly, Sandra Bringay, Benjamin Commandré, Marc Chaumont, Mustapha Derras, Laurent Deruelle, Mathieu Roche, Fabrice Rodriguez, Gerard Subsol, and Maguelonne Teisseire (2017), "Cart’Eaux: an automatic mapping procedure for wastewater networks using machine learning and data mining", Abstract Paper (1 page), number H031-259166, presented at 2017 Fall Meeting in session Computational Intelligence and Machine Learning Methods in Water and Environmental Management, AGU ("the largest and preeminent Earth and space science meeting in the world"), New Orleans, LA, 11-15 Dec, 2017, 1 page. Abstract (pdf). Poster (pdf). Papa Mamadou Ndiaye, Marc Chaumont, Mehdi Yedroudj, Ahmad Zakaria, " Stéganographie et Stéganalyse des images JPEG Couleur ", CORESA’2017, COmpression et REprésentation des Signaux Audiovisuels, Caen, France, 20-21 septembre, 2017, 5 pages, sciencesconf.org:coresa2017:161204. Papier (pdf). Slides (pdf). Mehdi Yedroudj, Marc Chaumont, Frédéric Comby, " Yedroudj-Net: un réseaux de neurones efficace pour la stéganalyse spatiale ", CORESA’2017, COmpression et REprésentation des Signaux Audiovisuels, Caen, France, 20-21 septembre, 2017, 6 pages, sciencesconf.org:coresa2017:161315. Papier (pdf). Slides (pdf). Lionel Pibre, Marc Chaumont, Gerard Subsol, Dino Ienco, and Mustapha Derras, " How to deal with multi-source data for three detection based on deep learning " GlobalSIP'2017, The fifth IEEE Global Conference on Signal and Information Processing - Symposium on Sparse Signal Processing and Deep Learning, November 14–16, 2017, Montreal, Canada, 5 pages, Paper (pdf). Slides (pdf). Benjamin COMMANDRE, Nanée CHAHINIAN, Jean-Stéphane BAILLY, Marc CHAUMONT, Gérard SUBSOL, Fabrice RODRIGUEZ, Mustapha DERRAS, Laurent DERUELLE, Carole DELENE, "Automatic Reconstruction of Urban Wastewater Networks Based on Uncertain Manhole Cover Locations", ICUD'2017, 14th IWA/IAHR International Conference on Urban Drainage, 10 – 15 September 2017, Prague, Czech Republic, Pages 2345-2352, Extended abstract. Paper (pdf). Slides (pdf). Benjamin COMMANDRE, Driss EN-NEJJARY, Lionel PIBRE, Marc CHAUMONT, Carole DELENNE, Nanée CHAHINIAN, "Manhole Cover Localization in Aerial Images with a Deep Learning Approach", ISPRS'2017, International Society for Photogrammetry and Remote Sensing Workshop, June 6 - 9, 2017, Hannover, Germany, Institute of Photogrammetry and GeoInformation, Leibniz Universität Hannover, XLII-1/W1, 333-338, Extended Abstract, 6 pages. Paper (pdf). Slides (pdf). Ph.D. student: L. Pibre. Advisors: M. Chaumont, G. Subsol, D. Ienco, and M. Derras. "Detection of Urban Trees in Multiple-Source Aerial Data (Optical, Infrared, DSM)", Two-pages paper on the thesis work, poster session, IEEE ICASSP’2017 M.Sc./Ph.D. Forum, International Conference on Acoustics, Speech, and Signal Processing, New Orleans, USA, March 5-9, 2017. In the conference proceedings. http://www.ieee-icassp2017.org/msc-phd-forum.html. Paper (pdf). Poster (pdf). L. Pibre, M. Chaumont, G. Subsol, D. Ienco, and M. Derras. "Détection d’arbres urbains à partir de données aériennes multi-sources (optique, infrarouge, MNS)", TEMU'2017, Atelier Télédétection pour l'Etude des Milieux Urbains, Centre International de Conférences de Météo-France, Toulouse, France, 16-17 janvier, 2017. Présentation orale. http://www.meteo.fr/cic/meetings/2017/TEMU/. Abstract (pdf). Slides (pdf). Amel Tuama, Marc Chaumont and Frederic Comby, "Camera Model Identification With The Use of Deep Convolutional Neural Networks", WIFS'2016, IEEE International Workshop on Information Forensics and Security, December 4-7, 2016, Abu Dhabi, UAE, 6 pages, Acceptance rate = 32%. Paper (pdf). Slides (pdf). Sebastien Villon, Marc Chaumont, Gerard Subsol, Sebastien Villeger, Thomas Claverie, David Mouillot, "Coral reef fish detection and recognition in underwater videos by supervised machine learning : Comparison between Deep Learning and hog+svm methods", ACIVS'2016, Advanced Concepts for Intelligent Vision Systems, Lecce, Italy, October 24-27, 2016, 12 pages, published by Springer in the Lecture Notes in Computer Science series (pdf). Slides (pdf). J. Pasquet, M. Chaumont, G. Subsol, and M. Derras, "Speeding-up a Convolutional Neural Network by Connecting an SVM Network", ICIP'2016, IEEE International Conference on Image Processing, Phoenix, Arizona, USA, September 25-28, 2016, 5 pages, Acceptance rate is about 45%. Paper (pdf). Slides (pdf). Amel Tuama , Frederic Comby, Marc Chaumont, "Camera Model Identification Based Machine Learning Approach With High Order Statistics Features", EUSIPCO'2016, 24th European Signal Processing Conference 2016, Budapest, Hungary, August 29 - September 2, 2016, 978-0-9928-6265-7/16, pp 1183-1187 (pdf). Poster (pdf). Hasan Abdulrahman, Marc Chaumont, Philippe Montesinos, and Baptiste Magnier, "Color Image Steganalysis Based on Steerable Gaussian Filters Bank," IH&MMSec'2016, in Proceedings of the 4th ACM workshop on Information Hiding and Multimedia Security, Vigo, Galicia, Spain, 6 pages, June 20-22, 2016. Acceptance Rate = 36.2%. pdf. slides. Matlab code. FAQ. L. Pibre, M. Chaumont, D. Ienco, et J. Pasquet " Étude des réseaux de neurones sur la stéganalyse ", CORESA’2016, COmpression et REprésentation des Signaux Audiovisuels, Nancy, France, 19-20 mai, 2016, 6 pages. pdf. slides. Lionel Pibre, Jérôme Pasquet, Dino Ienco, and Marc Chaumont, "Deep learning is a good steganalysis tool when embedding key is reused for different images, even if there is a cover source-mismatch," EI'2016, in Proceedings of Media Watermarking, Security, and Forensics, Part of IS&T International Symposium on Electronic Imaging, San Francisco, California, USA, 14-18 Feb. 2016, 11 pages. pdf, slides. FAQ and parameters are given here: SteganalysisWithDeepLearning.html. Jérôme Pasquet, Gérard Subsol, Mustapha Derras, and Marc Chaumont, "Optimizing color information processing inside an SVM network," EI'2016, in Proceedings of Visual Information Processing and Communication VII, Part of IS&T International Symposium on Electronic Imaging, San Francisco, California, USA, 14-18 Feb. 2016, 6 pages. pdf, slides. Jérôme Pasquet, Tomas Desert, Olivier Bartoli, Marc Chaumont, Carole Delenne, Gérard Subsol, Mustapha Derras and Nanée Chahinian, " Detection of manhole covers in high-resolution aerial images of urban areas by combining two methods " IEEE Journal of Selected Topics in Applied Earth Observations and Remote Sensing, 6 pages, 2016. Impact Factor = 2.145. pdf. Hasan Abadulrahman, Marc Chaumont, Philippe Montesinos and Baptiste Magnier, "Color Images Stegananalysis Using RGB Channel Geometric Transformation Measures", Wiley Journal on Security and Communication Networks (SCN) - Special Issue on Cyber Crime, Edited By: Hsiao-Hwa Chen and Hamid R. Sharif, Guest Editors: Wojciech Mazurczyk, Krzysztof Szczypiorski, Zoran Duric, Dengpan Ye, Wuhan University, extended paper of IWCC, 11 pages, ISSN 1939-0122, DOI 10.1002/sec.1427, 2016, pdf. Amel Tuama , Frederic Comby, Marc Chaumont, "Source Camera Model Identification Using Features from Contaminated Sensor Noise", Chapter of Digital-Forensics and Watermarking, Springer series Lecture Notes in Computer Science, pp 83-93, Volume 9569, 31 March 2016, ISBN 978-3-319-31960-5, DOI 10.1007/978-3-319-31960-5_8, Revised Selected Paper from the 14th International Workshop on Digital-Forensics and Watermarking, IWDW'2015, Tokyo, Japan, October 7-10, 2015. Amel Tuama, Frederic Comby, and Marc Chaumont, "Source Camera Model Identification Using Features From Contaminated Sensor Noise", IWDW'2015, The 14th International Workshop on Digital-forensics and Watermarking, http://iwdw2015.tokyo/index.php, Proceedings as Lecture Notes in Computer Science (LNCS) by Springer, Tokyo, Japan, 7-10 october, 2015, 11 pages. pdf. J. Pasquet, M. Chaumont, G. Subsol, and M. Derras. "An Efficient Multi-Resolution SVM Network Approach For Object Detection In Aerial Images", MLSP'2015, The 25th IEEE International Workshop on Machine Learning for Signal Processing, http://mlsp2015.conwiz.dk/home.htm, September 17-20, Boston, USA, 6 pages. pdf. slides. H. Abadulrahman, M. Chaumont, P. Montesinos, and B. Magnier. "Color Image Steganalysis using Correlations between RGB Channels", IWCC2015, The 4th International Workshop on Cyber Crime, http://stegano.net/IWCC2015/, co-located with 10th International Conference on Availability, Reliability and Security - ARES 2015, organized by W. Mazurczyk, K. Szczypiorski, and A. Janicki, Université Paul Sabatier, Toulouse, France, August 24-28, 2015, 7 pages. pdf. J. Pasquet, T. Desert, O. Bartoli, M. Chaumont, C. Delenne, G. Subsol, M. Derras, and N. Chahinian "Detection of manhole covers in high-resolution aerial images of urban areas by combining two methods", JURSE'2015, Joint Urban Remote Sensing Event, Lausanne, Switzerland, 30 March - 1 April 2015, 4 pages. pdf. J. Pasquet, G. Subsol, et M. Chaumont " Comparaison de la segmentation pixel et segmentation objet pour la détection d’objets multiples et variables dans des images ", CORESA’2014, COmpression et REprésentation des Signaux Audiovisuels, Reims, France, 26-27 novembre, 2014, 7 pages. pdf. J. Pasquet, S. Bringay, M. Chaumont, “Steganalysis with Cover-Source Mismatch and a Small Learning Database”, EUSIPCO 2014, 22nd European Signal Processing Conference 2014, Lisbon, Portugal, sep., 2014, 5 pages. abstract. pdf. slides. poster. Version du manuscrit d'HDR soutenue le 23 juillet 2013 (pdf). Slides (pdf). J. Pasquet, S. Bringay, et M. Chaumont « Des millions d'images pour la stéganalyse : inutile », CORESA’2013, COmpression et REprésentation des Signaux Audiovisuels, Le Creusot, France, 28-29 novembre, 2013, 6 pages. (pdf). Poster (pdf). M. Chaumont, L. Tribouillard, G. Subsol, F. Courtade, J. Pasquet and M. Derras, "Automatic localization of tombs in aerial imagery: application to the digital archiving of cemetery heritage", Digital Heritage - International Congress 2013 - 28 Oct - 01 Nov, Marseille, France. Acceptance Rate around 25%, 4 pages (pdf). Slides (pdf). S. Kouider and M. Chaumont and W. Puech, "Adaptive Steganography by Oracle (ASO)", ICME'2013, IEEE International Conference on Multimedia and Expo, San Jose, California, USA, July 15 - 19, 2013, 6 pages (pdf). Acceptance Rate around 30%. Poster (pdf). Z. Shahid, M. Chaumont, and W. Puech, "H.264/AVC video watermarking for active fingerprinting based on Tardos code", Signal, Image and Video Processing, Springer, Special Issue on Image and Video Processing for Security, Editor-in-Chief: Murat Kunt, Journal no. 11760. Publication date: Beginning of 2013. M. Chaumont, W. Puech, and C. Lahanier, "Securing Color Information of an Image by Concealing the Color Palette", The Journal of Systems & Software (JSS), Elsevier, Accepted 13 Nov 2012, DOI : 10.1016/j.jss.2012.11.042, 14 pages, (pdf). M. Chaumont, "Rotation Based Acceleration of Informed Embedding in DPTC Watermarking Scheme", International Journal of Image Processing and Visual Communication (IJIPVC), Open access journal (Creative Commons License 3.0), Chief Editor: Avinash Jha, Volume: 1, Issue: 2, pages: 19-28, October 15th 2012. ISSN (Online) 2319-1724. 10 pages (pdf). http://www.ijipvc.org/issue_2.html. M. Chaumont and S. Kouider, "Steganalysis by Ensemble Classifiers with Boosting by Regression, and Post-Selection of Features", ICIP'2012, IEEE International Conference on Image Processing, Lake Buena Vista (suburb of Orlando), Florida, USA, September 30 - October 3, 2012, 4 pages (pdf). Slides (pdf). S. Kouider and M. Chaumont and W. Puech, "Technical Points About Adaptive Steganography by Oracle (ASO)", EUSIPCO'2012, 20th European Signal Processing Conference 2012, Bucharest, Romania, August 27 - 31, 2012, pages 1703-1707, 5 pages (pdf). Slides (pdf). S. Kouider, M. Chaumont, et W. Puech, « Stéganographie Adaptative par Oracle (ASO) », CORESA’2012, COmpression et REprésentation des Signaux Audiovisuels, Lille, France, 24-25 mai, 2012, 6 pages, http://www-rech.telecom-lille1.eu/coresa2012/. (pdf). Slides (pdf). I. Diop, S. M. Farssi, M. Chaumont, O. Khouma, et H. B. Diouf, « Utilisation des codes LDPC en stéganographie », CORESA’2012, COmpression et REprésentation des Signaux Audiovisuels, Lille, France, 24-25 mai, 2012, 7 pages, http://www-rech.telecom-lille1.eu/coresa2012/. (pdf). Poster (pdf). I. Diop, and S. Farssi, and M. Chaumont, and M. Khouma, and O. Diouf, and H. B. Tall, and K. Sylla, " Using of LDPC codes in steganography ", Journal of Theoretical and Applied Information Technology (www.jatit.org), April 2012, 38(1), 103–109. ISSN:18173195. (pdf). D. Goudia, M. Chaumont, W. Puech, and N. H. Said, "Quantization Watermarking for Joint Compression and Data Hiding Schemes", Watermarking / Book 1, édité par Dr. Mithun Das Gupta, ISBN 979-953-307-583-8 – InTech, 2012, 26 pages. (pdf), http://www.intechopen.com/books/watermarking-volume-1/quantization-watermarking-for-joint-compression-and-data-hiding-schemes. D. Goudia, M. Chaumont, W. Puech et N. H. Said, "Joint Trellis Coded Quantization Watermarking for JPEG2000 images", Annals of telecommunications - annales des télécommunications: Volume 67, Issue 7, Signal, Image and Multimedia Processing, Springer, DOI : 10.1007/s12243-011-0280-9, pages 407-421, 2012. Impact Factors = 0.602 (JCR : Journal Citation Reports de Thomson Reuters 2010). (pdf). http://www.springerlink.com/openurl.asp?genre=article&id=doi:10.1007/s12243-011-0280-9. D. Goudia, M. Chaumont, et W. Puech N. H. Said, « Un Schéma conjoint de dissimulation de données (Data Hiding) dans JPEG2000 basé sur la quantification codée par treillis (TCQ) », 23ème édition du colloque GRETSI sur le traitement du signal et des images, Bordeaux, Septembre 2011, 4 pages (pdf), (slides). D. Goudia, M. Chaumont, W. Puech, and N. H. Said, “A Joint Trellis Coded Quantization (TCQ) Data Hiding Scheme in the JPEG2000 Part 2 Coding Framework”, The 19th European Signal Processing Conference, EUSIPCO’2011, Barcelona, Spain, September 2011, 5 pages (pdf), (slides). M. Chaumont, and D. Goudia, “TCQ Practical Evaluation in the Hyper-Cube Watermarking Framework”, IEEE International Conference on Multimedia and Expo, ICME'2011, Barcelona, Spain, 11-15 July 2011, 6 pages (pdf), (poster). M. Chaumont, Invited Paper – Tutorial: “Ensuring security of H.264 videos by using watermarking”, Mobile Multimedia/Image Processing, Security, and Applications, Part of SPIE Defense, Security, and Sensing, DSS'2011, SPIE'2011, Orlando, Florida, USA, 25-29 April 2011, Volume 8063, 10 pages (pdf), (slides). Z. Shahid, M. Chaumont, and W. Puech, Chapter “Scalable Video Coding” from the Book “Effective Video Coding for Multimedia Applications”, Edited by Sudhakar Radhakrishnan, Editor InTech, Croatia, http://intechweb.org/, ISBN 978-953-307-177-0, 292 pages, April 2011, 18 pages (pdf). Z. Shahid, M. Chaumont and W. Puech, “Considering the reconstruction loop for data hiding of intra- and inter-frames of H.264/AVC ", Signal, Image and Video Processing, Springer, pp 1-19, April 2011 (pdf). Z. Shahid, M. Chaumont and W. Puech, “Fast Protection of H.264/AVC by Selective Encryption of CAVLC and CABAC for I & P Frames ", IEEE Transactions on Circuits and Systems for Video Technology., Vol 9, March 2011, 17 pages (pdf). M. Chaumont, D. Goudia, W. Puech, “Hyper-cube watermarking scheme”, VIPC’2011, SPIE’2011, Visual Information Processing and Communication II, Part of IS&T/SPIE 23th Annual Symposium on Electronic Imaging, San Francisco, California, USA, 23-27 January 2011, Volume 7882, paper 7882-10, 9 pages (pdf). Slides (pdf). D. Goudia, M. Chaumont, W. Puech, N. Hadj Said, “A joint JPEG2000 compression and watermarking system using a TCQ-based quantization scheme”, VIPC’2011, SPIE’2011, Visual Information Processing and Communication II, Part of IS&T/SPIE 23th Annual Symposium on Electronic Imaging, San Francisco, California, USA, 23-27 January 2011, Volume 7882, paper 7882-11 (pdf). Slides (pdf). Z. Shahid, M. Chaumont and W. Puech, “Spread Spectrum-Based Watermarking for Tardos Code-Based Fingerprinting of H.264/AVC Video”, ICIP'2010, IEEE International Conference on Image Processing, Hong-Kong, China, 26-29 September, 2010, 4 pages (pdf) (demo_video). Poster (pdf). Z. Shahid, M. Chaumont and W. Puech, “Over The Real-Time Selective Encryption of AVS Video Coding Standard”, EUSIPCO’2010, The 18th European Signal Processing Conference, Aalborg, Denmark, 23-27 August, 2010, 5 pages (pdf). Slides (pdf). Z. Shahid, M. Chaumont and W. Puech, “Selective Encryption of C2DVLC of AVS Video Coding Standard for I & P Frames” ICME’2010, IEEE International Conference on Multimedia & Expo, Singapore, 19-23 July, 2010, 6 pages (pdf). Slides (pdf). M. Chaumont, « A Novel Embedding Technique For Dirty Paper Trellis Codes Watermarking”, VIPC’2010, SPIE’2010, Visual Information Processing and Communication, Part of IS&T/SPIE 22th Annual Symposium on Electronic Imaging, San Jose, California, USA, 17-21 January 2010, Volume 7543, paper 7543-38 (pdf). Poster (pdf). O. Berrezoug et M. Chaumont, « Tatouage robuste aux attaques de désynchronisations » MajecSTIC’2009, MAnifestation des JEunes Chercheurs en Sciences et Technologies de l'Information et de la Communication (conférence organisée par des doctorants pour des chercheurs débutants : Master 2, doctorants, post-docs, ATER...), Avignon, France, 16-18 novembre, 2009, 8 pages (pdf). Slides (pdf). Z. Shahid, M. Chaumont and W. Puech, « Selective and Scalable Encryption of Enhancement Layers for Dyadic Scalable H.264/AVC by Scrambling of Scan Patterns », ICIP'2009, IEEE International Conference on Image Processing, Cairo, Egypt, 7-11 November, 2009, 4 pages (pdf). Poster (pdf). M. Chaumont and W. Puech, Chapter “Protecting the color information by hiding it” from the Book "Recent Advances in Signal Processing", Edited by Ashraf A Zaher, Editor InTech, Croatia, http://intechweb.org/, ISBN 978-953-307-002-5, 544 pages, November 2009, (pdf). Also available from: http://sciyo.com/articles/show/title/protecting-the-color-information-by-hiding-it. M.Chaumont, « Une nouvelle technique pour le tatouage par Dirty Paper Trellis Code (DPTC) », GRETSI’2009, 22ème Colloque GRETSI sur le traitement du signal et des images, Dijon, France, 8-11 Septembre, 2009, 4 pages (pdf). Slides (pdf). M. Chaumont, « Psychovisual Rotation-based DPTC Watermarking Scheme », EUSIPCO’2009, The 17th European Signal Processing Conference, Glasgow, Scotland, 24-28 August, 2009 (pdf). Slides (pdf). Z. Shahid, P. Meuel, M. Chaumont and W. Puech, « Considering the Reconstruction Loop for Watermarking of Intra and Inter Frames of H.264/AVC », EUSIPCO’2009, The 17th European Signal Processing Conference, Glasgow, Scotland, 24-28 August, 2009 (pdf). Poster (pdf). Z. Shahid, M. Chaumont and W. Puech, « Fast Protection of H.264/AVC by Selective Encryption of CABAC For I & P Frames », EUSIPCO’2009, The 17th European Signal Processing Conference, Glasgow, Scotland, 24-28 August, 2009 (pdf). Slides (pdf). M. Chaumont, “ Fast Embedding Technique For Dirty Paper Trellis Watermarking,” in 8th International Workshop on Digital Watermarking, IWDW’2009, University of Surrey, Guildford, United Kingdom, Aug. 2009(pdf). Poster (pdf). N. Tournier, M. Chaumont, W. Puech, "Tatouage informé hiérarchique d’un message hiérarchisé (en vue de la protection vidéo)" CORESA’2009, COmpression et REprésentation des Signaux Audiovisuels, Toulouse, 19-20 Mars 2009, (pdf). Slides (pdf). Z. Shahid, M. Chaumont and W. Puech, « Fast Protection of H.264/AVC by Selective Encryption », Singaporean-French IPAL Symposium, SinFra’2009, Fusionopolis, Singapore, 18th - 20th February 2009, (pdf). M. Chaumont et W. Puech, « A High Capacity Reversible Watermarking Scheme », VCIP’2009, SPIE’2009, Visual Communications and Image Processing, Part of IS&T/SPIE 21th Annual Symposium on Electronic Imaging, San Jose, California, USA, 18–22 January 2009, Paper 7257-54, 9 pages, (pdf). Poster (pdf). Source Code (zip). Z. Shahid, M. Chaumont and W. Puech, « An Adaptive Scan of High Frequency Subbands of Dyadic Intra Frame in MPEG4-AVC/H.264 Scalable Video Coding », VCIP’2009, SPIE’2009, Visual Communications and Image Processing, Part of IS&T/SPIE 21th Annual Symposium on Electronic Imaging, San Jose, California, USA, 18–22 January 2009, Paper 7257-29, (pdf). 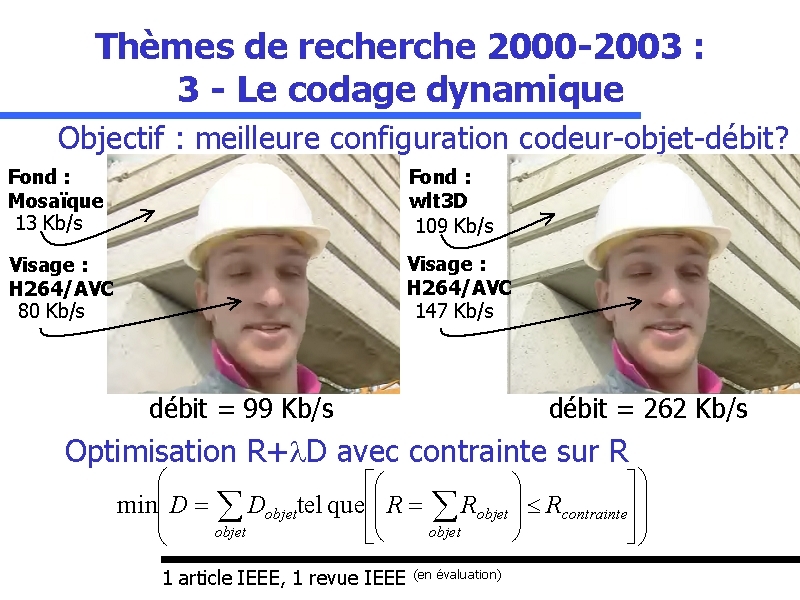 P. Meuel, M. Chaumont and W. Puech, « Insertion de données cachées pour une reconstruction sans perte de Régions d’Intérêts dans des vidéos H.264 » CORESA’2007, COmpression et REprésentation des Signaux Audiovisuels, Montpellier, 8-9 Novembre 2007. (version pdf). M. Chaumont and W. Puech, « A Grey-Level Image Embedding its Color Palette », ICIP’2007, IEEE International Conference on Image Processing, San Antonio, Texas, USA, 16-19 September, 2007, 4 pages. (version pdf). Poster poster.pdf. P. Meuel, M. Chaumont and W. Puech, « Data Hiding in H.264 Video For Lossless Reconstruction of Region », EUSIPCO’2007, 15th European Signal Processing Conference, Poznan, Poland, 3-7 September, 2007, 5 pages. (version pdf). M. Chaumont et W. Puech, « Insertion d’une palette couleur dans une image en niveaux de gris », GRETSI’2007, 21ème Colloque GRETSI sur le traitement du signal et des images, Troyes, France, 11-14 Septembre, 2007, 4 pages, http://www.gretsi2007.org/. (version pdf). Poster poster.pdf. M. Chaumont et W. Puech, « Fast Protection of the Color of High Dimension Digital Painting Images », WIAMIS’2007, The 8th International Workshop on Image Analysis for Multimedia Interactive Services, Santorini, Greece, 6-8 June, 2007, 4 pages. (version pdf). Poster poster.pdf. M. Chaumont et W. Puech. "A Fast and Efficient Method to Protect Color Images", Visual Communications and Image Processing, Part of the IS&T/SPIE Symposium on Electronic Imaging, VCIP’2007, SPIE’2007, San Jose, Californie, USA, 28 Janvier – 1 Février 2007. (version pdf). Poster poster.pdf. M. Chaumont et W. Puech. 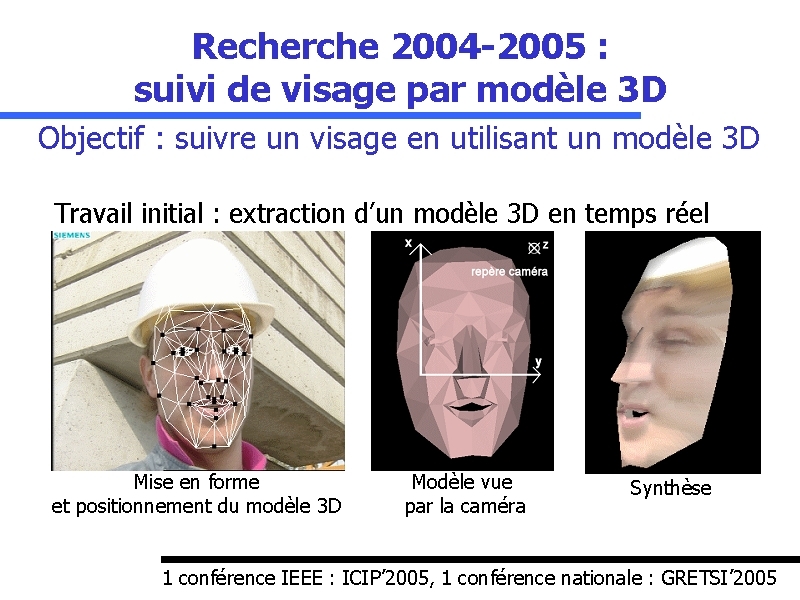 "3D face model tracking based on a multiresolution active search", Visual Communications and Image Processing, Part of the IS&T/SPIE Symposium on Electronic Imaging, VCIP’2007, SPIE’2007, San Jose, Californie, USA, 28 Janvier – 1 Février 2007. (version pdf). Poster poster.pdf. K. Hayat, W. Puech, G. Gesquière, M. Chaumont. « Wavelet-based data-hiding of DEM in the context of real-time 3D visualization » , Visualization and Data Analysis 2007, Part of the IS&T/SPIE Symposium on Electronic Imaging, VDA’2007, SPIE’2007, San Jose, Californie, USA, 28 Janvier – 1 Février 2007. (version pdf). Poster poster.pdf. M. Chaumont et W. Puech, « Une image couleur cachée dans une image en niveaux de gris », COmpression et REprésentation des Signaux Audiovisuels, CORESA’2006, Novembre 2006. (version pdf). K. Hayat, W. Puech, G. Gesquières, M. Chaumont. "Visualisation 3D temps-réel à distance de MNT par insertion de données cachées basée ondelettes",COmpression et REprésentation des Signaux Audiovisuels, CORESA’2006, Novembre 2006. ( version pdf). M. Chaumont et W. Puech. « A DCT-Based Data-Hiding Method to Embed the Color Information in a JPEG Grey Level Image », EUSIPCO’2006, The European Signal Processing Conference, Pise, Italie, Septembre 2006. (version pdf). B. Beaumesnil, M. Chaumont et F. Luthon. "Liptracking and MPEG4 Animation with Feedback Control", IEEE International Conference On Acoustics, Speech, and Signal Processing, ICASSP’2006, Mai 2006. (démo modèle3D ; démo suivi). (version pdf). M. Chaumont, S. Pateux, et H. Nicolas, "Object-based video coding using a dynamic coding approach", IEEE. International Conference On Image Processing, ICIP’2004, Oct. 2004, (version pdf). Fichier power-point (poster) : poster.ppt. Thèse de M. Chaumont, "Représentation en objets vidéo pour un codage progressif et concurrentiel des séquences d'images", 13 novembre 2003, (version pdf). 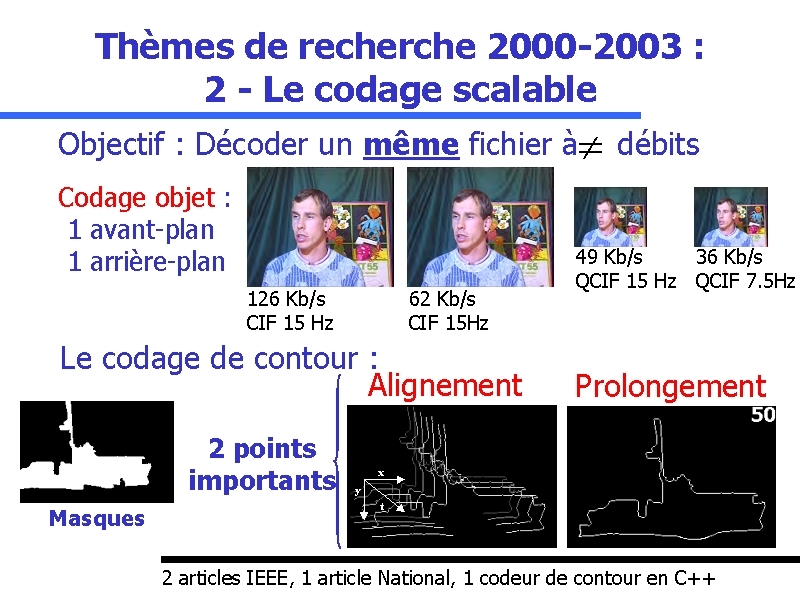 M. Chaumont, N. Camas et S. Pateux, "Fully scalable object based video coder based on analysis-synthesis scheme", IEEE. International Conference On Image Processing, ICIP’2003, Sep. 2003, (version pdf). Fichier power-point auto-extractible (présentation à emporter) : pngsetup.exe + pres0.ppz. M. Chaumont, S. Pateux, et H. Nicolas, "Codage efficace de contour avec perte utilisant la consistance spatio-temporelle", Colloque GRETSI sur le traitement du signal et des images, GRETSI’2003, Sep. 2003, (version pdf). Fichier power-point auto-extractible (présentation à emporter) : pngsetup.exe + pres0.ppz. M. Chaumont, S. Pateux, and H. Nicolas, "Efficient lossy contour coding using spatio-temporal consistency", Picture Coding Symposium, PCS2003, Apr. 2003, (version pdf). Fichier power-point auto-extractible (présentation à emporter) : pngsetup.exe + pres0.ppz. 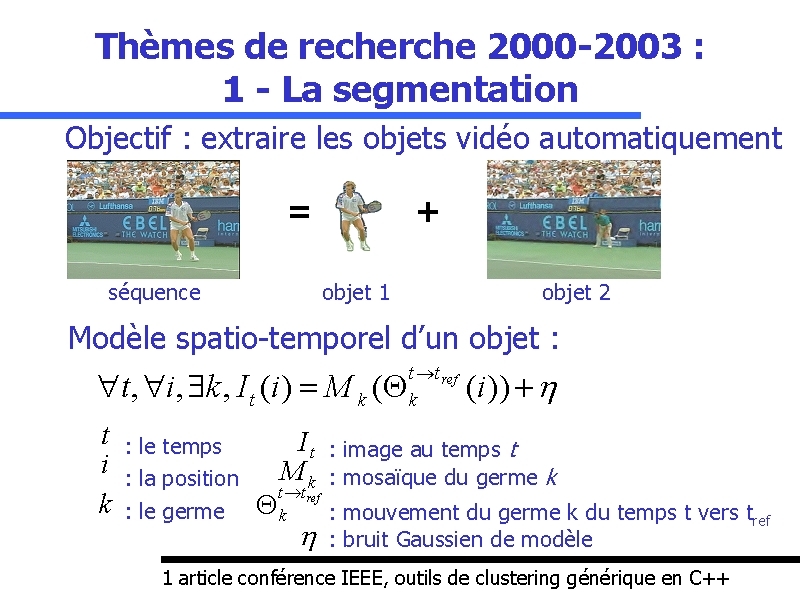 M. Chaumont, S. Pateux, and H. Nicolas, "Segmentation of non-rigid video objects using long term temporal consistency", IEEE. International Conference on Image Processing, ICIP2002, Sep. 2002, (version pdf).